… JUNE 23rd 1988, (and they were courting a long time before that) but twenty five years ago this month James Hansen NASA climate expert, testified before Congress and said ”it is time to stop waffling so much and say that the evidence is pretty strong that the greenhouse effect is here.” Clarifying this position he said that it was 99 per cent certain that the planet was already experiencing a long-term warming trend and that human-made greenhouse gases were almost certainly responsible. He further noted that, “global warming enhanced both extremes of the water cycle, meaning stronger droughts and forest fires, on the one hand, but also heavier rains and floods.” And we have all, to varying degrees, experienced some of those extreme weather events. Hansen’s assessment was based on what was solid scientific evidence back then and has only been confirmed by hard science over and over, a million times over, in the years that have passed since. In April 2013, based on a review of 11,944 peer reviewed scientific papers written between 1991 and 2011, John Cook et al. 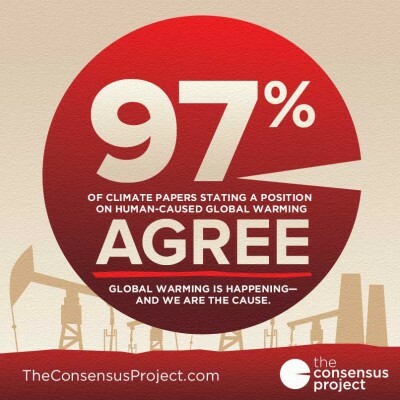 found that there was a 97% consensus that global warming was man made. 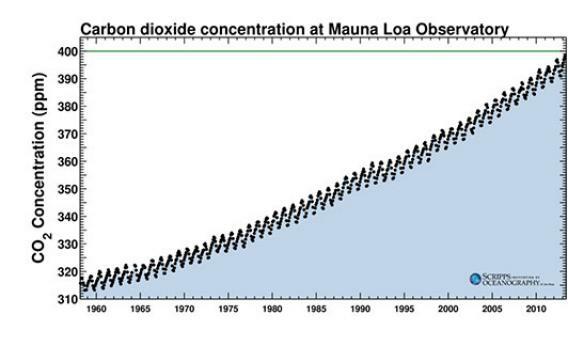 As if in anticipation of celebrating the 25th anniversary of Hansen’s warning, on May 10th this year the Manua Lau observatory in Hawaii documented the atmospheric concentration of CO2 as rolling past the point of 400 parts per million (ppm) for the first time. This up from 280ppm at the start of the fossil fuel powered Industrial Revolution. Manua Loa also noted that second highest annual jump of carbon dioxide levels ever was an increase of 2.67 ppm which occurred in 2012. As we have seen record high temperature records being broken, and then broken again during this past quarter century, so we have seen the scientific correlation of Big Oil marching in time with the thermometer, and making record profits. If we added this variable to the graph above we would see it demonstrated mathematically. Running counter to every evolutionary drive honed over millions of years– to procreate and give the genes passed down the best chance of survival– the forces of corporate Capital act like a malignant cancer that relentlessly pursues an ultimately self-defeating existence. It is eating away at the culture of its host cells and destroying those cells. It is destroying us. In the twenty five years since Hansen’s warning, Cancer Capitalism has advanced from a moderately bad condition to the aggressive final stages that we and our children are now experiencing. Since the Deepwater Horizon BP oil spill disaster of 2010, which spewed some 4 million barrels of oil into the Gulf, there have been 15 major oil spills, 8 of which involved ruptured pipelines. Most recently back in March of this year, the Exxon Mobil owned Pegasus tar sands pipeline spewed around 5000 barrels of tar sands diluted bitumen into the town’s neighborhoods, forming a lake of sludge that released toxic fumes, threatened health, wildlife and property, and caused the evacuation of 22 homes. Exxon Mobil showed its priorities by overseeing the imposition of a ‘no fly zone’ over the disaster site, proving that its chief concern was the containment of public opinion rather than containing the oil in its pipelines. If the Keystone XL pipeline was coming through our backyard we would resist. People all along the proposed pipeline routes are resisting, not that you would ever know it from the corporate owned ‘no fly zone’ imposing media. If it were you or I who were liable for any of those oil spills we would never work again, being in a jail where they had thrown away the key. Not so the corporate personhood of Exxon and BP, which delivers the same benefits as individuals, with none of the penalties when things go wrong. Did the Exxon Valdez oil spill disaster of 1989 harm Exxon’s ability to operate in any significant way any? Short answer no. Long answer the oil spilled from that disaster is still causing environmental damage, and by waging a twenty year legal battle Exxon managed to reduce punitive damages from five billion to a little over half a million and even got money back from the insurance company for the ship going down. To Big Oil, ‘money no object’ and ‘at all costs’ are simply business expenses proven to further the cause of record profit making. If we took ten gallons of crude oil and spilled it inside Exxon HQ so it despoiled the lush carpeting and caused workers to be evacuated because of fears over the toxicity of the fumes we would be thrown in jail and in today’s climate branded a terrorist. The increase in measures designed to restrict civil liberties in this country march in time with increasing ppm of CO2 in the atmosphere and increasing Big Oil profits. Add it to the graph above. Oil spills are one thing, but Fossil Fuel’s major waste product remains all but invisible. As CO2. And unlike any other industries, the Fossil Fuel corporations are allowed to dump their waste into the environment without penalty. This despite the ‘checks and balances’ within the US political system giving the appearance of being alive and well. In 2007 twelve states took the EPA to the Supreme Court and forced it to put six greenhouse gases on the “air pollutant” list and thereby be subject to regulation under the Clean Air Act. The decision was upheld in 2012. 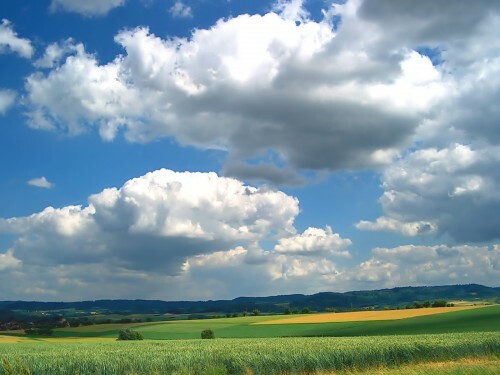 Yet in 2011 a record 11.4 billion tons of CO2 was dumped into the atmosphere. And if domestic regulations get a mite too restrictive concerning pollutant quotas, US corporations simply bypass the problem —as they did with troublesome trade unions— by outsourcing and setting up shop in countries where the rules are more malleable in their favor. If Exxon and its counterparts not only enlisted us to dump its major waste product into the atmosphere, but asked us to pay them for the privilege of doing so, all the while knowing that to do so eats away at the future habitability of our planet, we would resist right? Right! We have been resisting. Not that you would know it from the fossil-fuel-friendly, corporate owned media. Twenty five years of reasoned protest and carbon austerity at an individual level have evidently not worked in getting Cancer Capitalism to alter its suicidal ‘take everyone down with them’ course. Twenty five years later carbon emissions are still increasing, and breaking new records. Given the planetary constraints of what we humans have allowed to be made into pressure-cooker-earth, something has to give. A revolution of some sort has to happen, and like all revolutions neither side will see where it comes from until it is fully in motion. But which way will it go? Karma won’t save us. Karma does not exist unless we believe insects shall inherit the earth. If Karma existed corporations would be seeing some comeuppance by now, self-destructing in the face of common sense. Alas, corporations have gone from strength to strength these past twenty five years, aided and abetted at every turn by government bending over backwards to deregulate in their favor. Here in the US we could take our lead from the 2nd amendment and form a “well regulated militia necessary to the security of a free state.” The point being democracy has become a complete sham. Our state and the political system that supports it have demonstrably become the instrument of the corporate business model, and thus been removed from the founding principle of “for the people, by the people.” The citizens of the US would be completely within their rights to take the state back. This is probably not recommended. The founding fathers were not sci-fi writers and could not have anticipated the current might and technological sophistication of the US military police machine. For example, they could not have forseen the near future inevitability of the US government using drone attacks on its own citizens on US soil. 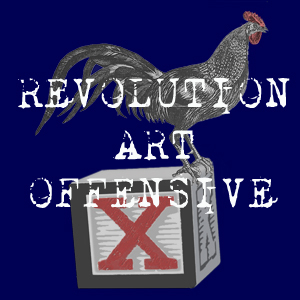 Historically, revolutions are won by those who can win the military over to their side. The Pentagon, unlike the free market bandits who run the Big Oil corporations, are actually really concerned about global warming. The whole military machine runs off oil, but whilst they are looking into alternative fuels to power their killing machines, their forward planning is all about how to deal with the disaster when it happens rather than prevent the disaster from happening in the first place. As it stands they will continue to defend the freedom of operation of corporation and government to exploit the planet as they have done these last 25 years, to widespread detriment of us, the ordinary global citizens. Not coincidentally, the presence and use of overwhelming force by the US military in the oil rich regions of the world has increased these past twenty five years, in step with ppm of CO2, Big Oil profits, measures designed to restrict civil liberty, and wedding anniversaries celebrated by State and Corporation. 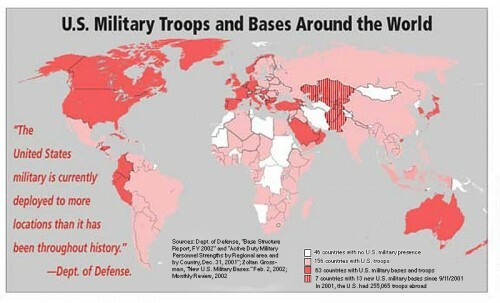 Put that on the graph too…measurable as the US military boot-print, in the more than 150 countries where they maintain bases. Look at the graph. It is seventh-grade math, not rocket science. Five indices. Five lines climbing in a forty five degree or steeper angle towards oblivion. Rather than have all-out bloody revolution where millions of us die or become refugees, even in the rich west…could we not take down the root cause of the cancer by more peaceable means? I was in England when Obama was re-elected in November 2012 and Howard Dean was on the BBC declaring — in reference to Obama’s marshaling of the female, black, Hispanic and youth vote — that the culture wars were over. With the future habitability of the planet for humans at stake, Dean clearly has his head in the tar sand. As the incidence of extreme weather events increases over the next twenty five years —making the effects of increasing CO2 in the atmosphere more visible— the defining twenty first century culture war will rage with corresponding heat: the culture of humanity and science against the culture of the corporation and capital. Looking at the lines on the graph, human survival on the planet earth requires the death of the raison d’être of Cancer Capital: the end of economic growth for its own sake. The founding fathers did not and could not have foreseen this mess, which is why the Constitution was made so that it can be amended. A new amendment enshrining the separation of State and Corporation would be a clear step in the right direction, though none of us can yet see whether this or similar measures necessary for human survival will require a new revolutionary war. This entry was posted in Politics and tagged Big Oil, BP. Exxon, global warming, Howard Dean, James Hansen, Keystone XL, Manua Loa, Obama. Bookmark the permalink.